When it comes to cooking and baking, I am all for anything that is going to make the process easier in the kitchen. Lucky for you, I stay on the lookout for innovative kitchen tools to save time, money, and mess. These 30 kitchen tools are some of my favourites whether I want to bake two different pies, make a delightful breakfast for the family, or spruce up my salads. You’ll definitely find a kitchen gadget (or ten) that you’ll want to add to your collection. 1. Self-Leveling Measuring Spoons. These self-leveling spoons or “levoons” will help you accurately measure spices, salt, flour, and other dry ingredients. 2. Kitchen Shears with Built-In Cutting Board. These super sharp shears include a knife with cutting board attached, fruit peeler, chef’s knife, and bottle opener. This is the perfect multi-purpose instrument for your kitchen. 3. Split Decision Pie Pan. Do your guests like different kinds of pies? Can’t decide between cherry and apple? This non-stick pie pan gives you the option to make two half pies or a full favourite. 4. Slow Cooker Liners. Nothing saves clean-up time like these slow cooker liners. You’ll want to use your crockpot at every meal! 5. AvoSeedo Avocado Tree Grower. Avocadoes are so expensive! Why not grow your own with this unique, fun gizmo? 6. Pineapple Peeler, Corer, and Slicer. I love pineapple, but I hate peeling it. This gadget makes it so easy to have fresh pineapple at home. 7. Cozyna Air Fryer. This is one of my favorite appliances for the kitchen. There are so many healthy recipes you can make in an air fryer from fried chicken to chocolate cake. The fryer even comes with 50 recipes. 8. Silicone Baking Mat. This non-stick baking mat is perfect for any oven recipe. It also includes a free oven liner to keep your oven mess-free. 9. Bamboo Cutting Board. Grid guides for sizes and types of cuts are imprinted on this gorgeous bamboo board. 10. Santoku Knife. This military-grade kitchen knife comes with a lifetime warranty against defects. This is the knife professional chefs use in their kitchens. 11. Perfect Bacon Bowl. If you love bacon, you’ll love this incredible contraption. Bacon bowls are delicious with eggs, potatoes, salad and more. 12. Countertop Spiral Vegetable Slicer. Create ribbons, accordion, and julienne cuts with this countertop mounted slicer. 13. Collapsible Oven Rack. When it comes to holiday cooking and baking, I cannot be without this item in my kitchen. Put it in the oven to cook casseroles, pies, and other sides along side your entree. 14. Soft-Serve Ice Cream Maker. Shop quality ice cream at home? Yes, please! We all scream for ice cream! 15. Fried Egg Molds. Why have a boring breakfast when you can eat your eggs in the shape of different animals, hearts, or stars with these adorable molds? 16. 20 Ounce Lunch Crock Pot. Take your hot lunch on-the-go with this individual crockpot. 17. Digital Meat Thermometer. Preset temperatures for nine different meats along with oven and meat temperature readings make this the best thermometer for your money. 18. Silicone Gloves and Meat Shredder. Not only do you receive these high quality BBQ gloves, you’ll also get a meat shredder, silicone baster, and more than 300 recipes. 19. Crispy Bacon Grill. This bacon grill is deemed as a healthier way to cook bacon. Complete with a drip tray, door liner, and non-stick cooking plate, you’ll love this tool for your kitchen. 20. 6 Cup Stuff It Up Pan. This uniquely designed pan holds foods straight up, so they can be stuffed without the mess. Stuff peppers, cakes, apples, and more with this amazing device. 21. Silicone Cake Mold Pan. Create your own cake shape with this fun, innovative cake mold. 22. Silicone Waffle Mold. Bake waffles without a messy waffle iron. You’ll love this fun, easy item for your kitchen. 23. Non-Stick Divided Skillet. One pan to cook an entire meal, sides and all? This is a must-have! 24. Mini Donut Factory. Fresh donuts pop out of this “factory” in 90 seconds. Decorate them, and enjoy your favorite breakfast treat! 25. Meatball Maker. Make standard big meatballs or stuff them with your favorite ingredients. 26. Salad Maker. I love my salad maker! Cut up lettuce and veggies and shake it up for the perfect salad. 27. Ravioli Rolling Pin. Making your own ravioli has never been easier with this incredible rolling pin. 28. Partyclette To-Go. Make mouthwatering melted cheese with this tabletop partyclette. 29. KitchenAid Vegetable Sheet Cutter. Add this incredible tool to your KitchenAid mixer to create sheets of fruits and vegetables. Spruce up your salads, make incredible pies, and more. 30. Nonstick Omelette Maker. Omelettes are definitely a breakfast fave at our house, but getting them just perfect in the pan is a challenge. This omelette maker is an easy alternative to a nonstick pan. I know what I’m asking Santa for this year! lol I love new gadgets! Some of these gadgets are really awesome.I would like to get the spiral vegetable slicer and the crispy bacon griller. I would love to have the Silicone baking mat. 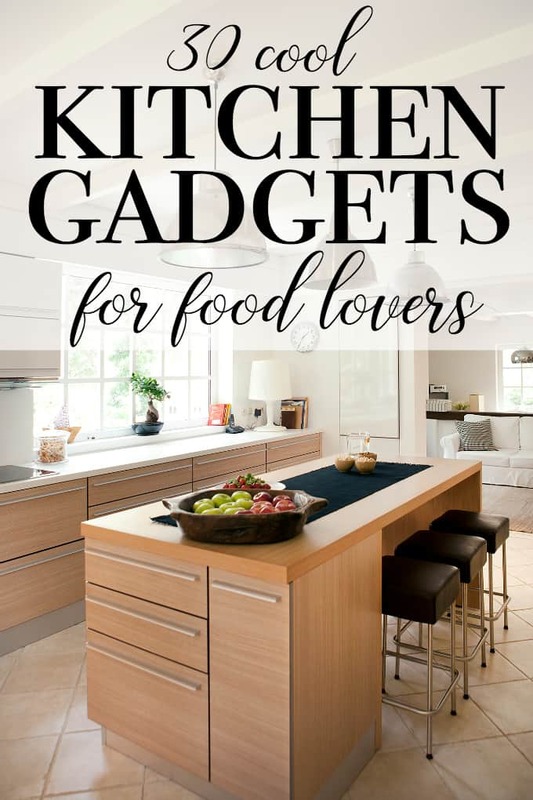 Going over this list again, makes some good gifts, especially for the kitchen accessory geek.